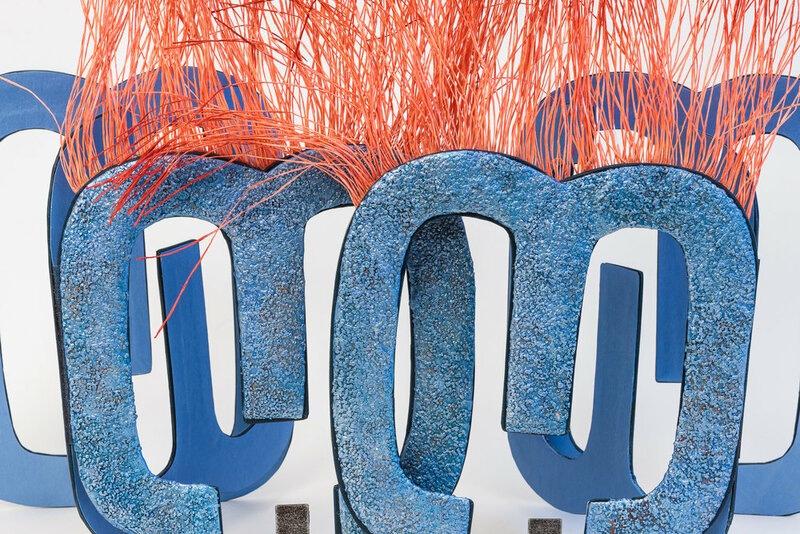 I was inspired to create the Threeology series in response to a large, scrap metal number “3” that had lived in my studio for 5 years. I began to view the object as pure shape, as interplay between positive and negative space with an anthropomorphic character. It led me to investigate the prevalence of groupings of three, the mathematical, cultural and spiritual meanings of the number “3” and how we perceive the shape in rotation. I am drawn to its symmetry, the structural stability of triangles, and the concepts of beginning, middle and end. Painted cutouts are bound together to create this accordion book based on a rotated number “3”. Two identical sections are connected magnetically at the center. The piece plays with color and overlapping positive/negative shapes. Balance and structural support allow one of the figures on each side to float above the ground plane. Orange paper fringes and the textured surface detail on the covers lend contrast and character to this delicate abstraction. Insiders is a lively accordion book that emphasizes movement, openability and balance. Its iridescent color and animation is like that of an insect. It is constructed with a series of painted paper shapes cut-away in forming the number “3”. They are sewn back-to-back and then to the narrow orange accordion. The front and back covers are separate books - a trio of hinged shapes that can be removed from the small slip case containers in which they rest. Whether closed, circular or hanging fully open, it invites touch. This scrap metal and paper figure was the first in the Threeology series. It dons the original metal number “3”. I used it as a stencil in the rest of the piece and for other works in the series. As I rotated it 90 degrees counterclockwise from the readable “3” position, it felt innately human and called out to me for hair. I disassociated the shapes from their known symbolic meaning. Light and airy, this piece experiments with the number “3” in rotation and as an anthropomorphic shape. It can unfold in a variety of configurations and its puppet-like parts can be animated. The cutout “3s” are hinged together to create new patterns and ways of being read. Mother is constructed with a series of painted paper shapes from the number “3”. They are sewn back-to-back and then to a narrow black accordion. The size, shape and visual weight of the cutouts suggest a nurturing female figure. This rotated “3” piece is a takeoff on a historical dos-a-dos bookbinding. 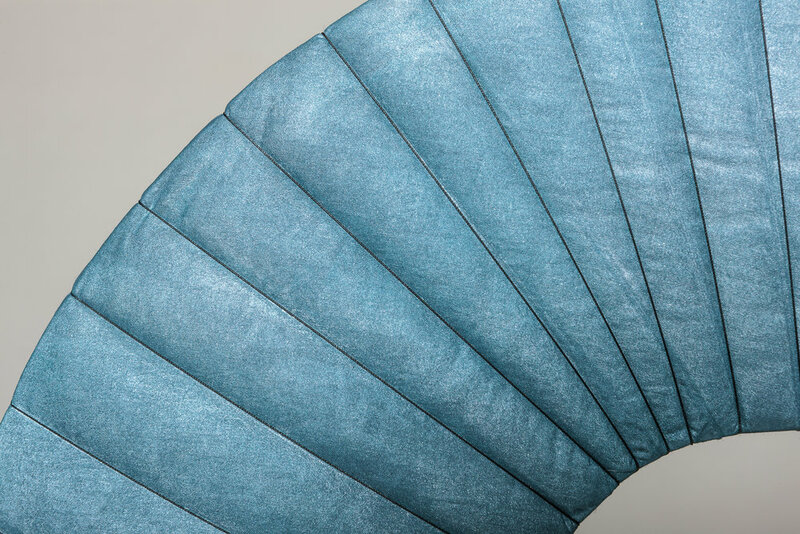 The solid, upholstered, center section connects to two covers that open on opposite ends. Inner, painted cross sections are revealed with a pull of the upholstery-fringe handles. It is a humorous variation on a theme and evokes peeking inside a cut geode. Trellis Wardrobe is a 5’ high sculpture (an elongated number “3” resembling Eurostile typeface) that explores the number as a trellis form and theatrical space. The zigzag lines on the lower surfaces and pocket openings on the sides, reveal its internal, triangular, truss-like structure. 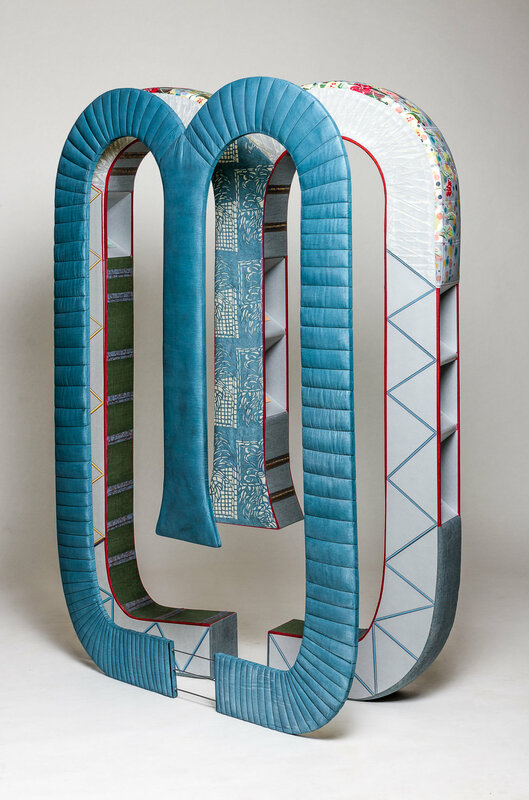 As it changes orientation, the “3” connects to number zero, and symmetrical letters such as M, W and E.
The blue, quilted outer panel is magnetic and detaches. I painted on my mother’s pristine, nasturtium-themed tablecloth and used it as upholstery fabric for the shoulders. The inside has detailed collage and drawing. Three-dozen magnets are hidden between the layers and encourage game-like adding of ephemera and small objects. The open view of Trellis Wardrobe is closet-like and invites entry.